Since my next book is about jailbreaks, I’ve been taking a few happy snaps. First up is HM Prison Pentridge, Melbourne, Victoria. Talk about recognisable. It has a very distinctive facade. It’s quite beautiful in a terrifying kind of way. And downright spooky. The design, colour and scale are a powerful combination. The result is a confronting building. It gives off vibes that say ‘Warning. Stay away. You won’t like it here’, which is just as well. The key to its foreboding-ness is the colouring of the stonework. Pentridge is famous for its bluestone walls and in the past was jokingly referred to as ‘The Bluestone College’, among other things. The bluestone is a local variety of basalt that is particularly dark and helps create an almost Gothic feel. Despite its seemingly impenetrable walls, there have been many escapes from Pentridge. Ralph Wahle escaped in 1960 and caused quite a stir because no one thought it could be done. Ronald Ryan and Peter Walker escaped in 1965 and caused widespread panic throughout the state because they were both considered crazed & vicious gunmen. Maxwell Skinner and Kevin Joiner attempted an escape in 1952 which, sadly, resulted in one fatality and one broken ankle. John Killick – Helicopter Man 1999, remember him? – spent time in Maximum Security H Division and made a dramatic escape attempt from E Division in 1968. Then there was the notorious escape-proof Jika Jika, opened in 1980 to house the most difficult and dangerous prisoners. It wasn’t a great success: four of them escaped three years later: Robert Wright, David McGauley, Timothy Neville and David Youlten. Again, this was a terrifying incident as Wright and McGauley were convicted murderers. D Division housed the lucky Remand prisoners. Throughout its dark bluestone history, there were a number of hangings inside the walls of Pentridge including the Brownout Strangler, Eddie Leonski, a deceptively fresh-faced young US-soldier-turned-serial-killer who murdered three women in the streets of Melbourne for no particular reason at the height of World War II. In 1961, Pentridge was the site of the last woman hanged in Australia. Her name was Jean Lee and she was involved in a lot of scams and the murder of an elderly man. She foolishly believed that they wouldn’t hang a woman. The state-sanctioned execution of Ronald Ryan, the last man hanged in Australia, took place in Pentridge in 1967. Much can be said about this but in another time and place. Pentridge no longer operates as a jail and, even better, no one is hanged by the neck until they are dead any more. It’s now in the throes of being transformed into an apartment complex. Time will tell if it is partially successful or ultra-successful or something else. Anyone busy working away behind a ten metre high pile of wrecked cars would be hard pressed to catch a glimpse of anything much. Especially a wily young thing like Stephen Jamieson. All you need is to climb up onto one of the partitions between the shower cubicles, hoist yourself into the shaft – maybe by throwing a knotted towel or two around the pipes at the side – and then claw your way up to the ceiling. 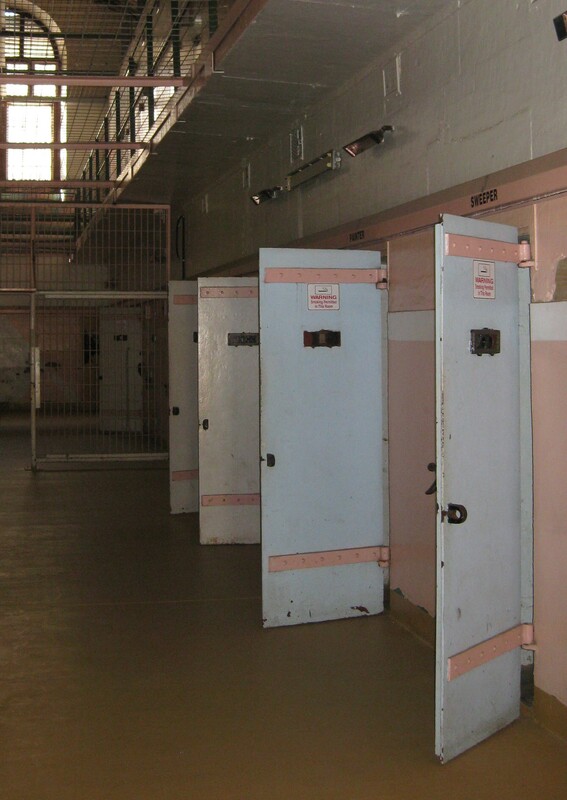 Maitland Gaol no longer operates but you can take tours that fill you in on the various happenings over the years. There are two notable features that will strike you. Three, if you’re interested in architecture. The gaol was designed by Mortimer Lewis, a highly regarded architect who designed Customs House in Sydney, Darlinghurst Gaol, Gladesville Lunatic Asylum, Newcastle Police Station, Berrima Courthouse and much more. But if you’re not interested in architecture, there are two notable features. The second notable feature is Maitland Gaol’s interiors. They are – how shall I put it? – a little unexpected. They’re straight from the 1970’s when a psychologist decided that the most soothing colour schemes for violent offenders was…cream? No. Battleship grey? No. Powder pink and baby blue? Yep. What else? The designers had a penchant for pastels. In 1997, Milat planned an escape with George Savvas, ex-Marrickville Council Alderman, drug trafficker and all-round colourful character. But authorities were onto it. Special squads were waiting with Rugers at key spots around the jail if they went ahead. Check it out: Milat/Savvas escape attempt. More to come including Boggo Road, Ballarat and Bendigo.